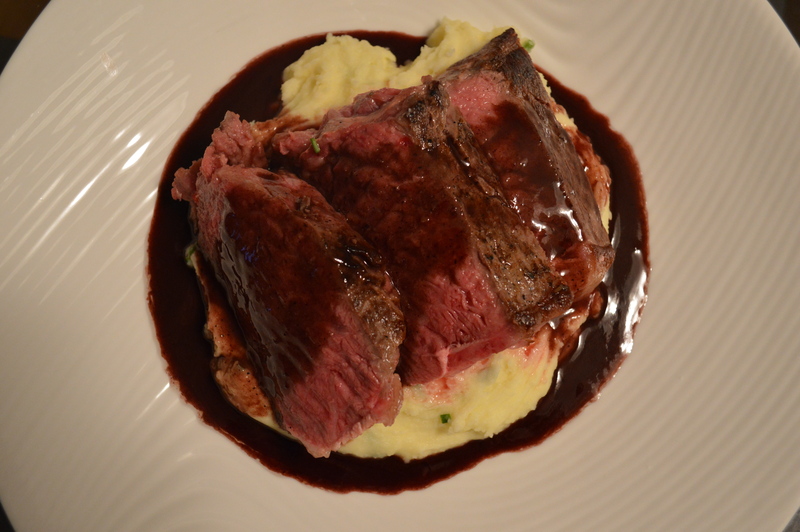 Sunday night was the last recipe that I will do from Chef Steps’ “Cooking Sous Vide: Getting Started” class — Steak with Red Wine Sauce. We have a lovely butcher here in Cottonwood – Snider Brothers – which is where I purchased my 2″ thick New York Strip Steak. I scaled the recipe down since it is only me and my husband, and we only eat red meat once at week, if that. The potatoes are my usual pureed potatoes, with chives added in this time (recipe below). My favorite are Yukon Gold, which are just so creamy. Then again, I never met a potato I didn’t like! Oh. My. Goodness. This steak was just so delicious! And the red wine sauce?!? And, the thing I love the most about Sous Vide cooking, is that aside from the quick sear before and after, it is largely hands off, which frees me up to do other things, ensuring that the timing is well coordinated. Anyway, I am going to switch gears in the kitchen for a moment. I got a copy of Ruhlman’s new book “How to Roast” for Christmas (autographed! ), so I want to dive into that for a moment. Not that I don’t know how to roast, but I appreciate his technical approaches to cooking, and I always learn so much. Sometimes it is helpful to step back and focus on the “right” way to do things in the kitchen, so that we can master everything else. Also, I should soon receive a copy of Dorie Greenspan’s “Baking Chez Moi”. I got it for $6 after eBay Bucks and the remnants of my eBay gift card. I’m really excited! Stay tuned for those reports. Peel each potato and cut into 12 pieces. Add your potatoes to a pot, and add enough water to cover by an inch. Salt the water well at this point, and you will need very little seasoning later on. Personally, I think that salting the water at this stage makes the salt easier to control than if you salted them after cooking, and the flavor is more innate. Anyway, bring your water to a boil, reduce to a simmer, and cook the potatoes until fork tender. Once fork tender, drain. Set a pot with your heavy cream and butter over medium heat, and heat through just until the butter melts. Don’t let it boil or even simmer. While your cream and butter are heating, pass your potatoes through a food mill (fine or medium plate) or a ricer. Once your butter has melted, add your cream mixture a half a cup at a time, mixing until incorporated to your desired consistency. I personally prefer my potatoes very creamy, but it your choice how soft you make them. This entry was posted in Meat, Modernist Cuisine, Sides, Sous Vide and tagged Potatoes, Sous Vide, Steak. Bookmark the permalink. Looks delicious!! Thanks for the mashed potato recipe too! I also have never met a potato I didn’t like! Have a great start to your week and look forward to more yummy posts! Thank you! Hope you have a great week too!